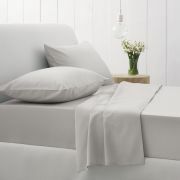 Extra Deep Sheets - View our range of Extra Deep Sheets here at Anthony Ryans linens shop, offering excellent quality Extra Deep Sheets to suit your needs. Do you ever find yourself wrestling with your sheets to then realise they are just not deep enough? Well we have the answer here for you. With generous depths up to 38cm from Sheridan and many others brands offering substantial depths we have your mattress covered, literally.